Among others, Typhoon Yolanda in 2013 and the 2004 Indian Ocean tsunami have highlighted the importance of mangroves in coastal protection. Of global storm events, the Philippines has the greatest intensity (maximum score of 5 on the Saifir-Simpson Hurricane Intensity Scale) and number (one-third). Mangroves have therefore captured the public imagination – student, NGO, government, religious and business groups plant mangroves themselves or raise money for others to plant. Even the national government planned to allocate PhP1 billion for mangrove rehabilitation in Yolanda sites. Such massive amounts of taxpayers’ and private funds beg the question: Are the planting protocols science-based? Mangroves are uniquely adapted to withstand harsh conditions of salty water and tidal inundation – but not more than 30% of the time. Hence mangroves are not uniformly distributed between high and low tide, but are found in the middle to upper intertidal levels (at or above mean sea level) where they remain mostly exposed. Fig. 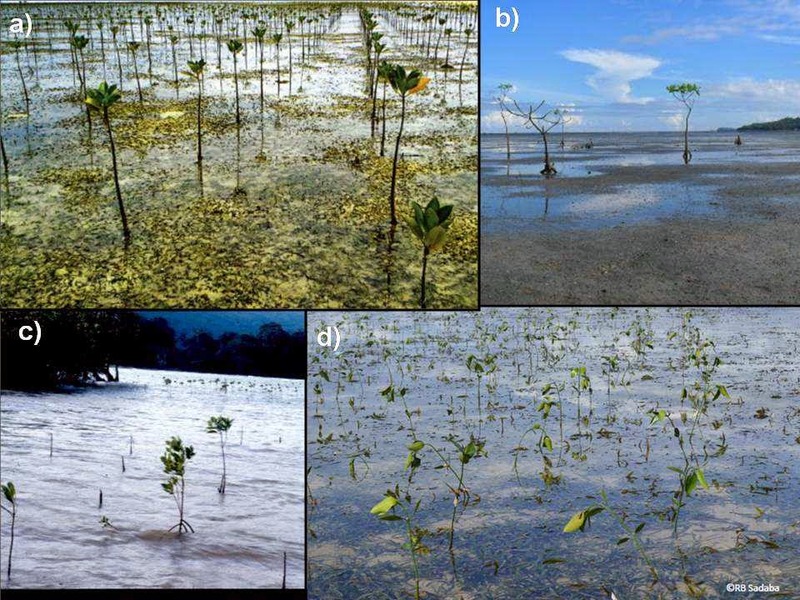 1: Intertidal location of mangroves and recommended planting zones (©J.H. Primavera). 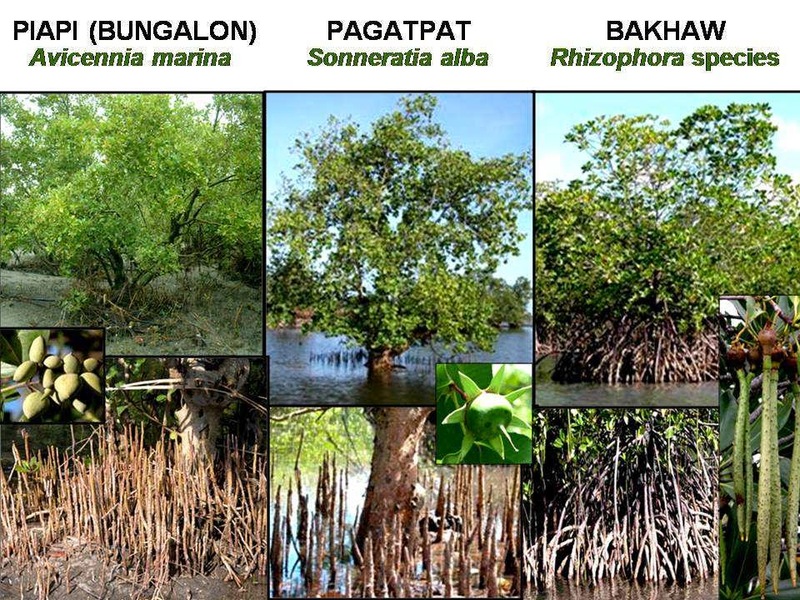 The 35-40 Philippine mangrove species are adaped to different substrates (sand, mud), salinity (full seawater, brackish water), but mainly to water level which determines how much flooding they can tolerate. Therefore most open seafronts are dominated by pagatpat Sonneratia alba and piapi Avicennia marina (Fig. 2) whose extensive lateral/cable roots firmly anchor the tree belowground. Bakhaw Rhizophora, whose aboveground prop/stilt roots cannot withstand strong wave/wind action, either hide behind the pagatpat-piapi zone, or line inner tidal rivers and creeks. So most bakhaw planted along the seafront are the WRONG SPECIES IN THE WRONG SITES, as the scientific community has pointed out since the 1990s. Yet large Rhizophora propagules (or Tusok d Tongki, Cebuano for “sticking the propagules”) are favored over piapi/pagatpat whose small seeds require a nursery phase – Planting by Convenience, not by Ecology. This misguided preference for bakhaw is seen in logos, posters and t-shirts that prominently feature iconic bakhaw prop roots instead of pencil-/cone-shaped pneumatophores (arising from lateral roots) of piapi/pagatpat. Worse, the practice of seagrass planting continues to this day. In 2003, the Philippine Association of Marine Science called on the Department of Environment and Natural Resources to stop planting on seagrasses, a call repeated and disseminated to DENR field staff in 2005 and 2007. Yet 10 years later, seagrass beds in Cordova, Cebu were again planted to bakhaw (Fig. 3) financed by Oil Spill funds. According to National Scientist Edgardo Gomez, (some) foresters argue that If grasses can be planted to forests, likewise seagrasses can become mangroves, a well-meaning but unscientific transformation. Current mangrove programs also prefer to reforest the ecologically difficult but low- to no-conflict, open access seafront. It should prioritize the biophysically easier but sociopolitically challenging reversion of abandoned ponds, where mangroves used to thrive. Fig. 3: Common seagrass planting along seafront, e.g., seagrass beds in a) Divilacan, Isabela (Cagayan Valley Environment Update, 2014) and d) Cordova, Cebu (photo by R.B. Sadaba) has mostly high mortality in b) Iloilo and c) Palawan. A more worrisome practice has emerged – the Tongki Protocols, by which money is siphoned off reforestation budgets by unscrupulous parties. To switch from easy-to-source and easy-to-plant bakhaw to nursery-reared piapi/pagatpat will affect the modus operandi (and flow of money). 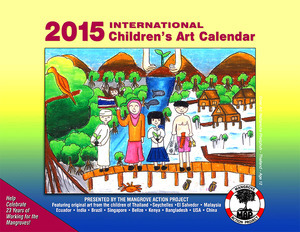 Moreover, many mangrove programs are driven by Guinness and/or photo ops. In 2012, around 7,000 volunteers planted one million mangrove propagules in El Verde, Camarines Sur, targetting the Guinness Book of Records. Another million mangrove planting event in Quezon province was named 2014 Galing Pook awardee. Nothing wrong with planting in the morning, posting Facebook photos in the evening, and print/TV media coverage the next day so long as planting is science-based. Unfortunately, the focus on initial planting forgets the endproduct – the mature forest. Like graduation ceremonies, tree planting is only the commencement, yet media rarely report, if at all, the massive mortalities of failed plantings. Tracking down mangrove survival rates in Camarines Sur via dozens of text/email exchanges with local officials has been fruitless. Reluctance to share bakhaw monitoring data suggests high mortality rates. Not surprisingly the National Greening Program and other projects define reforestation success as the % of target area or number of seedlings actually planted, rather than survival rates (which remain unreported). Yet mangroves and other trees are living beings whose measures of success are growth and survival. Moreover, such commonplace mortality has led to the dubious but profitable practice of replacement planting, with payment based on number planted. The more plants that die, the more are replaced and, expectedly, the more money is paid. In contrast, No Pay Planting is promoted by the Zoological Society of London, an Iloilo-based NGO, on the premise that labor contributed by fisherfolk entitles them to mangrove ownership. Instead, the ZSL Community-based Mangrove Rehabilitation Project assists communities in applying for tenure, e.g., the Community-Based Mangrove Forest Management Agreement. As owners and de facto managers, coastal folk are obligated to nurture the mangroves to maturity. Even when successful, bakhaw plantings on seagrass beds are one ecosystem’s gain and another’s loss. Conversion to mangrove forests will deprive mudflats and seagrass fauna, e.g., danggit (rabbitfish), dugong, crabs and birds of their habitats. At the least, white sand substrates turn dark muddy-sand. Interestingly, Philippine mangrove area increased from only ~140,000 ha in 1987-88 to ~250,000 ha in 2003. How many of over 100,000 hectares of new mangroves are former seagrass beds? The DENR and other agencies must account for such conversions, e.g., in Molacaboc, Negros Occidental and Olango, Cebu. To all Mangrove Planters/Conservationists: 1) Do not plant bakhaw on seagrass beds and mudflats; 2) Plant pagatpat/piapi in the middle-upper intertidal; and 3) Government agencies should report % surviving mangroves rather than % of target seedlings/area planted. J.H. Primavera is Chief Mangrove Scientific Advisor of the Zoological Society of London, co-Chair of the IUCN Mangrove Specialist Group, Scientist Emerita of the SEAFDEC Aquaculture Department, and Pew Fellow in Marine Conservation. She will cover mangrove reversion of abandoned ponds in asequel. Indonesia and Netherlands launch large coastal safety initiative in Java. 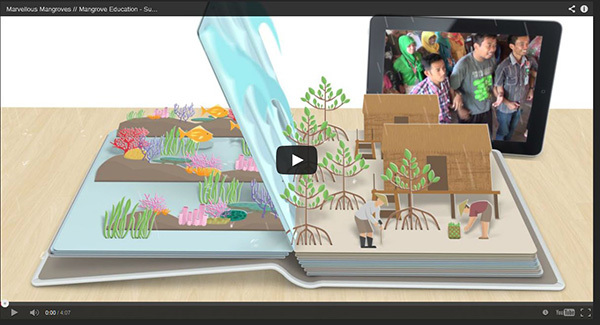 Marvellous Mangroves curriculum to Bangladeshi schools; It is a good initiative indeed! But, we have to be sure that whether B'desh government is going to include mangrove importance and functions in the school curriculum. If so, how they will be doing it and in which level of school? The another most important point is that who will be resource personnel working on it. Please include the good mangrove scientists on the process. It is very important to have the pure and good write up in Bengali on mangrove ecosystems. Please keep it up. Good concept indeed!Good luck!